Salmon burgers with lemon dill sauce takes the seafood sandwich to the next level. Healthy protein grilled to perfection and topped with lettuce, tomato, onions, and avocado. 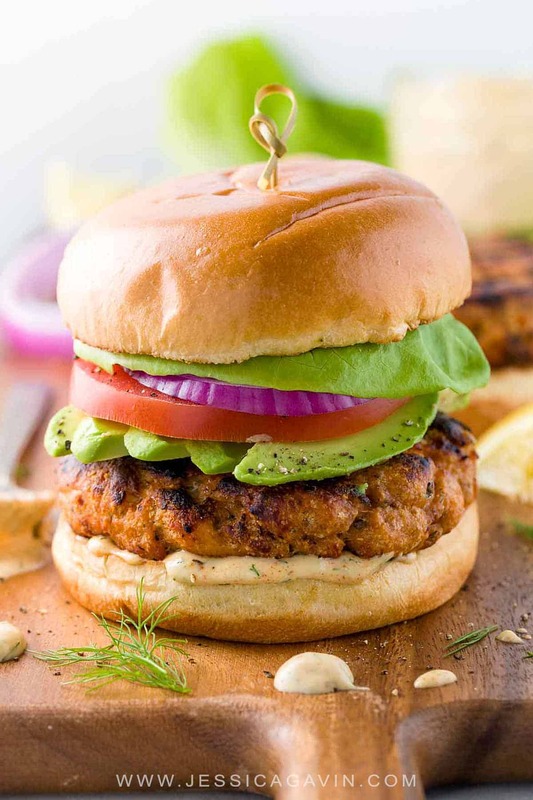 Salmon burgers with lemon dill sauce are a nutritious protein-packed option for grilling season. When the barbecue comes out, and it’s time to grill burgers, most go with classic juicy Angus beef, but when you’re trying to get your body right for summer, it’s nice to try a lighter yet still satisfying alternative. I’ve often grilled portioned salmon fillets for sandwiches, but I wanted to incorporate more flavor into the actual fish itself this time. I created a homemade salmon patty mixture that holds together nicely on the barbecue. The blended flavors of mustard, dill, onions, and capers all meld together with the delicious meat from the salmon. The creamy herb condiment topped on these burgers takes the flavors to the next level. Ready to get cooking? I often dread the dry and flavorless salmon patty. To up the ante, I’ve created a winning recipe for flavorful and moist burgers! Fish Selection: Salmon is an excellent choice because of the natural fat rich omega-3 fatty acids found in the flesh. The fat keeps the patties moist, tender and helps with binding the mixture together. There are additional nutritional benefits from eating salmon like protein, essential fatty acids that promote healthy joints, skin, and heart, B vitamins for energy, vitamin D, and the minerals selenium and phosphorus. Bread Crumbs: I’m a big fan of incorporating bread crumbs or a panade in ground meat or seafood. The bread helps to keep the patties tender and stay together, almost like a meatball. It also absorbs the juice from the fish as it cooks and keeps it locked inside of the patty, instead of being lost to the hot grill. Add-In’s: Salmon is a mild flavored fish with a flaky texture. That means that adding stronger tastes from pungent mustard, shallots, capers, and fresh dill can complement and enhance the eating experience. All of the salmon ingredients get coarsely chopped in a food processor for quick preparation and minimal mess. I have made these patties in my Vitamix before, and it worked well too. More stirring in between was needed to get all of the pieces of salmon broken down. I like to keep chunks of salmon in the mix for extra texture, and not make it an entirely smooth puree. These 1/2-inch salmon patties don’t drastically shrink on the grill like beef burgers. After a quick sear on the grill (I love those grill marks! ), it’s time to build our burgers! A lemon dill sauce is whisked together to enhance the flavor of the patty. I’ve also made a similar recipe with a creole mustard sauce too. Fresh dill, basil, shallots, lemon, mustard, and spicy cayenne pepper are added to a creamy mayonnaise base. Believe me. You’re going to want to serve extra sauce on the side to dip each bite! 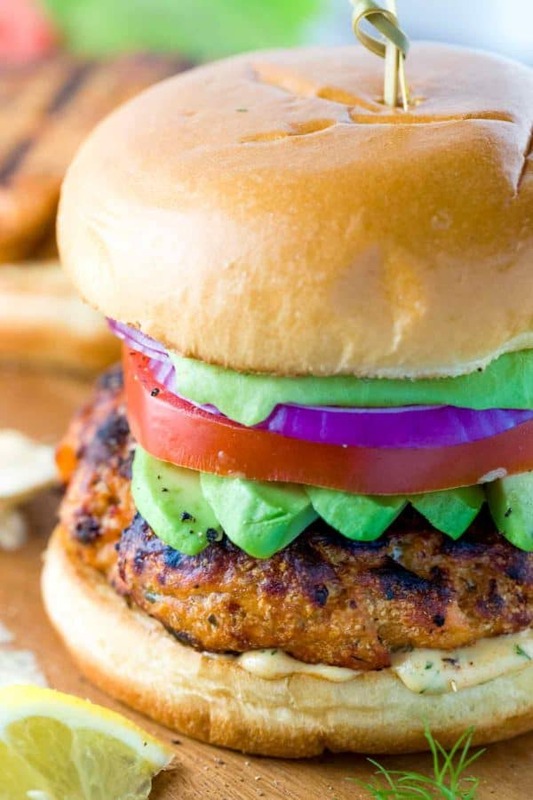 You can add any additional fixings that you like to make your salmon burgers even tastier. I like to add crisp bibb lettuce, sliced red onions, creamy avocado, and ripe tomatoes. For those looking for a delicious alternative to boring burgers, these homemade salmon patties are a game changer! 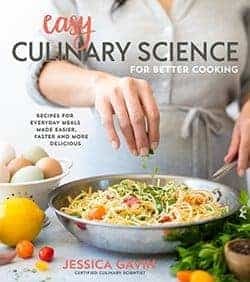 When cooking fish, the concept of carryover cooking (food continuing to cook after being removed from the heat source) does not occur as significantly as it does with beef or pork. These salmon patties will cook very quickly on the grill due to the direct high heat and cover method. After about 4 minutes on each side, check the center with an instant-read thermometer. At around 130°F, remove from the grill and serve right away. If you keep the patties warm on the side of the grill, or in the oven, it will continue to dry out. Fish doesn’t need additional time to rest to reach the desired doneness. Salmon burgers with homemade lemon dill sauce takes the seafood sandwich to the next level. Healthy protein grilled to perfection and topped with lettuce, tomato, onions, and avocado. Add cut salmon pieces, mustard, shallots, capers, dill, salt and pepper into a food processor or blender. Pulse and scrape down sides until the salmon is a coarsely ground, you want some small chunks and not overly pureed. Transfer mixture to a medium-sized bowl and add breadcrumbs, mix with a spatula until combined. Evenly divide the salmon mixture into 4 patties, about ½ inch thick. Cover and refrigerate until ready to grill. Heat grill to medium-high heat. Clean and oil the grill grates. Reduce heat to medium. Grill patties for 4 minutes covered, turn over and cook 3 to 4 more minutes covered. The internal temperature should be about 130°F, do not overcook! Grill the buns for a few minutes until warm and toasted. Combine all lemon dill sauce ingredients together in a small bowl. 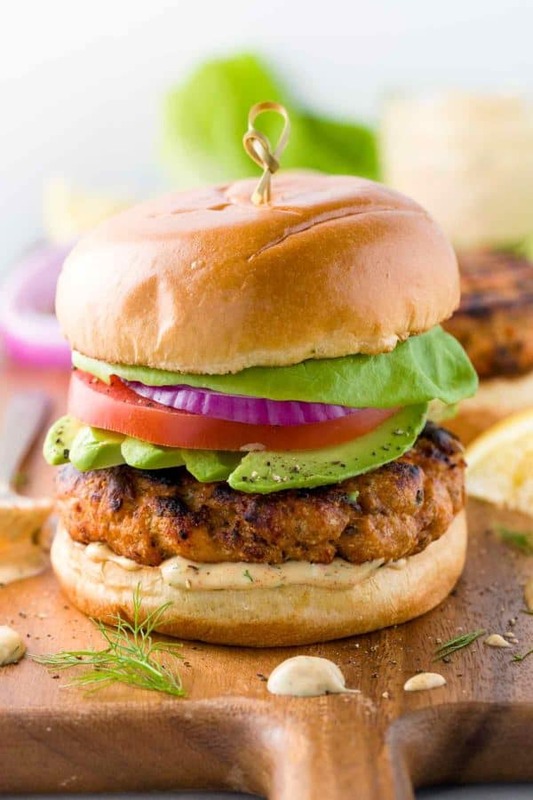 Add about 1 tablespoon of lemon dill sauce to each bottom bun, top with a salmon patty, avocado, tomato, onion, and lettuce. Heat a large skillet over medium-high heat. Add 1 tablespoon olive oil and heat until very hot. Add patties, working in batches if needed. Cook until golden brown, 4 minutes, flip. Cook until the internal temperature reaches 130°F, 3 to 4 minutes, do not overcook! I have never made salmon burgers before but thought these looked delicious, so i figured i would give them a try. they turned out to be absolutely amazing!! this recipe is so delicious and so easy. I made it for a few people and everyone loved them. Thanks for a great recipe!! Hi, this looks really great! I have a question though.. I don’t have a grill! Is there any way to cook the patties without a grill and still have it come out tasting great? I cooked them right in a frying pan with a tbsp of oil. cooked in about 6-8 min. I tested this recipe for an upcoming barbecue and used a slightly toasted brioche hamburger bun. It was absolutely delicious! The lemon dill sauce was a great addition. Sooooo good!! The sauce was amazing! I subbed onion and pickle for shallots and caper and used Panko bread crumbs and dried herbs but it still turned out so good! Also used canned salmon, drained but had to add an egg to hold it together. I did a “pantry-friendly” version since we are snowed in. Used everything I already had. This recipe halved made 3 large burgers. Thanks so much! I’ve had dried dill for the 5 years I’ve been married and this was the first time I’ve used it, but I liked it so much I’m going to be looking specifically for recipes with dill. Great ideas Abby! I’m going to try your revisions too! Thanks for posting this comment! Another beautifully plated recipe. Salmon is a favorite of mine and I love how you elevated the burger as I too found them often dry and flavorless. Thank you Judy! You definitely have to give this burger a try. It’s healthy and satisfying! This was my first try at a salmon burger, and it was delicious. I love the sauce, too. Gonna put it on my regular salmon fillets. Thank you. Do you need to cook the salmon before? No, process the raw fish to make the burgers. That helps it stick together when cooking. Could these patties be frozen and cooked later? Hi Jamie- Yes, you can freeze the salmon patties and then defrost before cooking. Do you use regular mustard or Dijon for the lemon dill sauce? Hi Sarah- I typically use ground Dijon mustard but you can use yellow mustard as well. Can i do this amazing recipe with chicken or beef? Cause most friends dont like salmon. Let me know what you think Rachel! I never know what to do with salmon. I buy the frozen salmon filets at Aldi because it’s just me who eats it. One salmon filet was 4oz so I divided the recipe by 5 by eye. (not hard if you cook a lot). I didn’t have shallots or capers so I used Chives and no capers. I used a small wrap instead of a bun. I used spinach instead of lettuce. This was 423 calories for me. I loved it so much I made it again tonight this time subbing oats for bread crumbs, greek yogurt for mayo and a cabbage leaf for a wrap. I cut out 167 calories to bring it down to 256 calories so I added a cucumber tomato salad and the whole dinner was 293 calories. Wow, you are incredible! 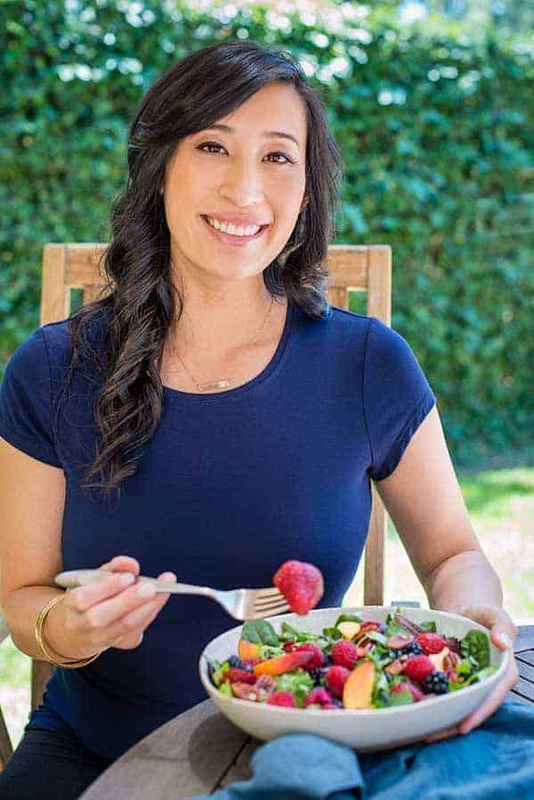 I love the substitutions and your intuition to make it even healthier.